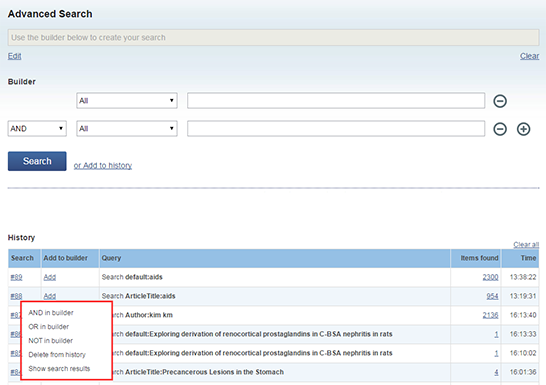 Default Search refers to Article Title, Vernacular Title, Abstract, Keywords, MeSH and Author. If any of these fields’ value contains the search terms, the record will be considered to meet the user’s search. The system will expand the search term intelligently, automatically achieving to synchronized retrieval, not only including the search term, but also the corresponding Headings and Subheadings. Journals approved by the WPRIM Regional Journal Selection Committee since 2007 are listed by journal title and country alphabetically.You can also find journals by selecting Journal Title, Abbreviation, Country, Publisher and ISSN. Advanced Search provides retrieval method with field combination. If you want to search different terms in different fields at one-time, please use the logic operator (AND, OR, NOT) in Search Builder. For each user, every retrieval process is reserved in cache as a search history, including serial number, number of hits, query expression and search time.Combine two or more queries to generate a new query by clicking the serial number and select the corresponding logic operators AND, OR and NOT.The system can save at most 100 queries for each user, and the search history is connected with session and will always valid till the user log out. 1) Set the number of articles per page through the selection box beside “Show”, default value is 10. 2) Click “Home”, “Prev”, “Next” or “End” to go to the first page, the previous page, the next page or the last page. For specific page, type page number into the input box after “Page”, and click “Go”. 3) Select the rank method through the selection box after “Sort by” on right panel. 4) Default display mode is Brief, including article title, author and journal related information, and user can select Abstract mode on right panel. 1) All Records: all hit records in this retrieval process (the maximum is 500). 2) Selected Records: articles have been selected. 3) All Records on Page: all articles on current page. 4) Records X to Y: limit the range by inputting the number manually. You can print or save your selected records with five file types, Normal type is the WPRIM’s own standard, and the others all can be imported into corresponding software directly. You can also obtain your selected records via E-mail: Click “E-mail”, type your E-mail address into the text box and click “Send”. Click “Result Analysis” on right panel to analyze the result. Steps: Select analyzed field (Rank the records by this field) → select the number of analyzed records → set display options → set the sorting method → click “Analyze Result”. 1) Sort by "Record count" means that displaying the results by the number of records. Sort by "Selected field" means that displaying the results alphabetically (A-Z) or numerically (0-9). 3) You can save the analysis report by clicking “Save Results”.